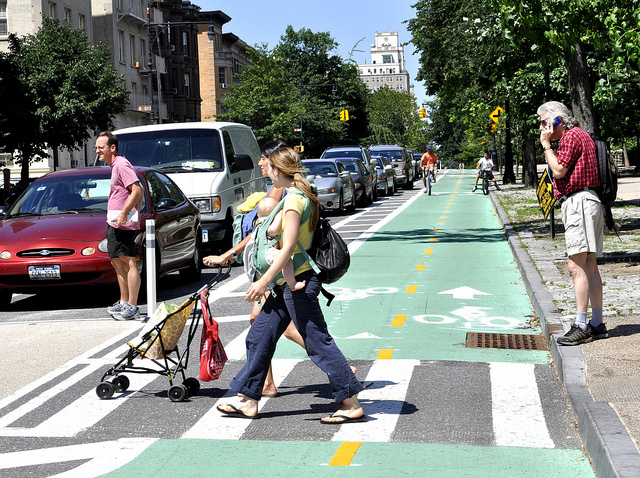 New York City leaders have begun implementing a Vision Zero policy in the city, which has helped to create separated bike lanes and greater traffic speed enforcement to decrease road fatalities. Photo by the New York City Department of Transportation/Flickr. According to the World Health Organization’s (WHO) Global status report on road safety 2013, only 7% of the world’s population is governed by comprehensive road safety laws. In a world that already sees 1.24 million deaths from traffic crashes each year and increasing motor vehicle usage, this is a frightening prospect and limits our thinking on traffic safety to driver behavior. Countries like Sweden, however, have taken ambitious, holistic steps to improve traffic safety and save lives through an initiative called Vision Zero, a road safety framework that asserts that “no loss of life is morally acceptable.” The concept has spread to places such as New York City, where newly elected Mayor Bill de Blasio campaigned and has adopted the approach. Both Sweden and New York City’s strategies are advanced for two reasons, the first being that they set clear targets. Research has revealed that setting ambitious road safety targets can help motivate stakeholders to improve road safety. Secondly, these policies shift the responsibility for road safety from only personal actions like wearing seat belts and helmets to a shared responsibility between road users and designers, which means also creating safer pedestrian infrastructure, automated enforcement, and reducing driving speeds. Together, these ideas can drastically change how countries and cities around the globe approach traffic safety. The Vision Zero Initiative is perhaps the most ambitious road safety framework ever implemented. Created in 1994 and adopted by the Swedish Parliament in 1997, Vision Zero sets the ambitious target of zero road fatalities or serious injuries on Swedish roads. The broader approach of shared responsibility resulted in design changes on inter-city highways and intra-city streets. According to The Economist, building 1,500 kilometers of “2+1” roads (a road design in which each lane of traffic takes turns using a middle lane for passing) has saved around 145 lives over the first decade of Vision Zero. In addition, 12,600 crossings made safer with clear marking and traffic calming are estimated to have halved the number of pedestrian deaths over the past five years. This new attitude has helped Sweden come closer to its goal, with 3 of every 100,000 people dying in traffic-related crashes each year. This is in contrast to 5.5 people per 100,000 in the European Union and 11.4 per 100,000 in the United States. Learning from Sweden, New York City has adopted the Vision Zero policy framework in an ambitious effort to rethink road safety and save lives. An analysis of the past five years of the city’s traffic fatalities have shown that 70% of pedestrian fatalities stem from causes outside of the pedestrian’s control. This means that the roots of the problem lay in systemic flaws like vehicle speeds, street design, and infrastructure. This new legislation grants New York City the authority to control speed limits, enhance traffic data collection, strengthen penalties for dangerous drivers, and increase usage of speed and red light cameras. The city reports that red light camera intersections alone have seen a 20% decrease in all injuries and a 31% decrease in pedestrian injuries. The city also plans to make safety improvements at 50 intersections, building on its success with street design improvements in recent years that resulted in a reduction of fatalities of 34% where implemented. Vision Zero is part of a larger Safe System approach to road safety, which has different names in different places. In the Netherlands, there’s sustainable safety. In Minnesota and Washington in the United States, the effort is called Towards Zero Deaths, and in New Zealand Safer Journeys. These share a mostly common methodology that recognizes that humans are fallible, and road designers must take this into account. The Safe System approach looks at more broadly at the physical forces in play, including enforcement, data collection, infrastructure, speed limits, technology, and driver behavior. In the United States, this is sometimes called the four E’s – engineering, enforcement, education, and emergency response/medical elements of traffic safety. The growing problem of traffic fatalities globally is most present in low- and middle-income countries. In India, there are roughly 134,000 reported traffic fatalities each year and growing. In Brazil, nearly 40,000 are reported dead from crashes, with over 50% of those pedestrians, bicyclists, and motorcyclists. In these high-fatality countries and cities within them, there are many opportunities for improving policies and practices in a more comprehensive way that is embodied in Vision Zero and safe systems programs and policies. With the success spreading from Sweden to New York City and down to New Zealand, city leaders must consider this comprehensive approach, particularly where its implementation can have the most impact.